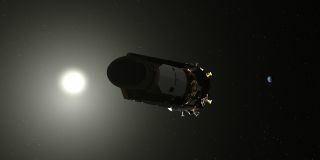 A view of Kepler, whose extended mission may be nearing an end as it runs out of fuel. The Kepler space telescope's prolific planet-hunting days will end soon. After finding more than 2,300 confirmed planets across its two missions, Kepler is low on fuel and will run out within several months, according to NASA engineers. "Our current estimates are that Kepler's tank will run dry within several months — but we've been surprised by its performance before! So, while we anticipate flight operations ending soon, we are prepared to continue as long as the fuel allows," Charlie Sobeck, system engineer for the Kepler mission, said in a NASA statement. The Kepler data will also be plumbed for years as scientists seek to confirm other possible planets in its archive. As of today (March 16), Kepler has confirmed the existence of 2,342 planets across its two missions — about two-thirds of all exoplanets ever discovered. (Just last month, Kepler scientists released a batch of 95 planets that are included in this total.) On top of that, there are 2,245 possible planets that require more observation — a ripe ground for future follow-up. The $600 million Kepler mission launched in 2009 to search for exoplanets in a fixed location in the constellation Cygnus. For four years, it watched the stars for the telltale dimming that occurs when an exoplanet crosses the face of a star. The mission's ultimate aim was to find rocky exoplanets that were Earth-size or smaller — a type of planet rarely found when Kepler went into orbit. But within a few years, Kepler's data showed that rocky planets are extremely common in the universe. Infographic showing how the K2 mission works. The mission was originally slated to last two years, but it was extended. In 2013, after four years of operation, three of Kepler's four gyroscopes — the "wheels" that aimed the craft — failed. Kepler couldn't maintain a steady gaze in space anymore. So NASA devised a new mission for the spacecraft, called K2. Using the pressure of the solar wind to maintain position, the spacecraft would rotate between different areas of the sky every three months (which, in the parlance of the mission, is called a "campaign"). This would allow Kepler to keep looking for exoplanets, albeit with a shorter orbital period. Even with K2, Kepler exceeded expectations. "Initially, the Kepler team estimated that the K2 mission could conduct 10 campaigns with the remaining fuel," Sobeck said. "It turns out, we were overly conservative. The mission has already completed 16 campaigns, and this month entered its 17th." He added that there is no gas gauge on Kepler showing when it might run out of fuel, so the team relies on estimates. These estimates consider factors such as changes in thruster performance and drops in the fuel tank's pressure. But Kepler has an advantage: It's located in deep space. It's not close to a planet hosting icy moons, unlike the Galileo mission near Jupiter (which orbited there between 1995 and 2003) and the Cassini mission near Saturn (which orbited the planet from 2004 to 2017) . When Cassini and Galileo ran low on fuel, NASA engineers deliberately aimed these spacecraft on death dives into their respective planets, just in case the drifting machines accidentally smacked into an icy moon that has the potential to host life. Kepler, by contrast, can keep going as long as feasible. "We can afford to squeeze every last drop of data from the spacecraft — and ultimately that means bringing home even more data for science," Sobeck said. "Who knows what surprises about our universe will be in that final downlink to Earth?" While Kepler is in the twilight of its mission, another planet-hunting spacecraft is ready to take the stage. NASA's Transiting Exoplanet Survey Satellite will launch no earlier than April 16 from Cape Canaveral Air Force Station in Florida. It will do a full-sky survey of at least 200,000 stars, focusing on planets orbiting stars that are brighter and closer to Kepler. This means it will be easier for scientists do follow-up observations using ground telescopes or the James Webb Space Telescope that is slated to launch in 2019.